You can pretty much do anything online these days. Shop, play games, study, set your DVR, even watch a live baby panda. The one thing you can't do yet? Vote. When it comes to Election Day, U.S. citizens still need to mail in a form or truck out to their local polling places to cast their vote. That may one day change, however, especially if PollVault has anything to say about it! The nonpartisan organization's new Web application "See Your Ballot" is a powerful new resource for voters, regardless of political party. 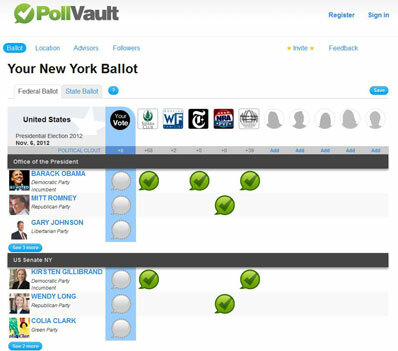 PollVault's user-friendly interface lets you type in your zipcode and see all the candidates running in your district. That's more than 12,000 candidates from over hundreds of state and local ballots. The key to its success? Crowdsourcing. With the simple digital ballot, you can select up to 10 advisors to see which candidates they're supporting. How do you pick your advisors? Simple. It can be any of your friends or family, or select organizations including Sierra Club, the NRA and The New York Times. The goal of the site is to educate. Rather than stepping into a voting booth unprepared and seeing a number of options you have no idea about, "Show Your Ballot" lets you easily do your homework ahead of time. You can comment on specific candidates, read up on platforms, and learn about each candidate’s background. Although the site is very user-friendly to navigate, I didn’t find this particulary helpful. It’s nice that this give bios on the major party candidates, they provide no information on the other people running. In this, they seem to be promoting only the established Right and Left. I guess everything has it’s limitations, though. I don’t find that very educational. Thanks for the feedback. PollVault is brand new, and growing fast. In the short few weeks since we launched nationally, we have added 12,000+ candidates, 200+ ballot propositions, and nearly 8000 candidate bios with 20% coverage for the 2000 non-Dem/Rep. candidates. We are working with our data provider (KnowWho.com) to aggregate as much data as candidates will make available as quickly as possible, with no agenda to promote, I assure you. The system is equally open to all, and if anyone is able to provide us with reliable data that will help inform voters, we will gladly make it available. We are in the process of developing self-service tools to allow campaigns and organizations to enter in candidate info & endorsement info directly, so that everyone gets equal & adequate billing. In the meantime, both may direct content & inquiries to contact@pollvault.com and we will welcome all comers. I was under the impression that there was a mobile app but I can’t find it in the Google play store. I can get to the Site on my DROID but it’s barely manageable.